Ned Lee Knapp, 92, of Little Rock, was born August 30, 1925 in St. Joseph, Missouri. He was one of four boys, and all the boys served our country during WWII. His oldest brother survived the Bataan Death March. Ned served in the army, in the European theater, fighting throughout France, Belgium (Battle of the Bulge) and Germany. 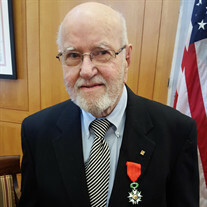 He was awarded two bronze stars for bravery during the war and in 2015 was given the French Legion of Honor in recognition of his wartime service in France. After the war, he attended SMU in Dallas Tx. In 1948, Ned married his high school sweetheart, Shirley Jean Sommers. He got his first sales job with Johnson Wax and the two moved to Kansas City, Kansas where they had their two children. In 1990, Ned retired as district manager from Zotos International. Ned's first and utmost priority was for his family. He enjoyed playing golf, bridge and poker; which he did weekly. Ned was well loved for his always cheerful humor and strong work ethic. He maintained his kind and fun disposition throughout his final illness which he faced with the same grace and bravery he displayed throughout his life. Ned was a loving and generous Father, Grandfather and Great Grandfather. He will be greatly missed. Ned is preceded in death by his parents, James and Wilda Knapp, his wife Shirley Sommers Knapp, and two brothers, Frank Knapp and Jay Knapp. Ned is survived by his brother, William Knapp; son, Kim "Bo " Knapp (Beverly) of Greenville S.C.; daughter, Jerelyn "Jerri "Berry (James) of Maumelle; six grandchildren, Sommer Salgaonkar of Maumelle, Zachary Berry of Maumelle, Austin Knapp (Mary Frances ) and John Knapp both of Greenville, S.C., Ashish Salgaonkar of Maumelle, Scott Zimmerebner of Fayetteville, Mollie Newton of Eldorado; and six great grandchildren, Jaya Salgaonkar, Ajay Salgaonkar, Alyssa Berry, Kaylee Berry, Mary Ellis Knapp, and Will Newton. Visitation will be Friday, June 29, at 2:00 P.M. followed by a funeral service at 3:00 P.M. at Smith-North Little Rock Funeral Home, 1921 Main Street.